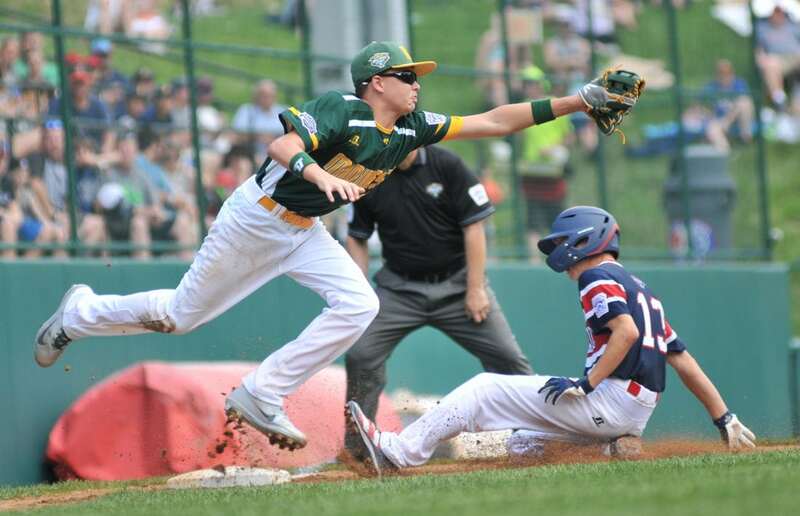 MARK NANCE/Sun-Gazette Iowa third baseman Alex Stewart reaches for the throw as New York’s Gregory Bruno safely slides into third on a wild pitch in the third inning on Thursday at Howard J. Lamade Stadium. A closer look at the Staten Island, New York, 5-2 win over Des Moines, Iowa, Thursday at Lamade Stadium. PLAY OF THE GAME: Gregory Bruno’s bases-loaded strikeouts. OK, this is two plays but both were huge. The New York ace was called upon in the third inning, coming in to a tie game with the bases loaded and one out. While Alex Stewart drew an RBI walk, Bruno came back strong and struck out the next two batters, leaving the bases loaded. Bruno ended the inning with a perfectly-placed, full-count fastball on the outside corner. If Bruno does not record those strikeouts, Iowa might have taken a multiple-run lead and the game’s complexion could have drastically changed. NEW YORK PLAYER OF THE GAME: Gregory Bruno–Four days after throwing a perfect game against Maryland in the Mid-Atlantic final, Bruno threw 2 2/3 innings of no-hit baseball and earned the win. The hard-throwing right-hander allowed just one hit and struck out seven as he remained undefeated this summer. He also ignited the game-tying rally when he hit a two-out RBI double in the third inning and scored on a subsequent wild pitch and throwing error. That helped New York win its 26th game over the last two seasons as the Mid-Atlantic champions trailed for the first time during the span. IOWA PLAYER OF THE GAME: Blake Larson–The third baseman was a tough out, going 2 for 3 and hitting a game-tying RBI double in the third inning that made it 1-1. Larson also ended Bruno’s eight consecutive no-hit innings when he ripped a one-out, fifth-inning single. BIG INNING: New York fourth — The Mid-Atlantic champions went ahead to stay, scoring two runs with one out and building a 4-2 lead. Logan Castellano ignited the game-changing rally with a walk. His hustle on John Calabrese’s ensuing single to right field forced an errant throw to third base. When the ball was overthrown, Castellano scored the go-ahead run and Calabrese sprinted to third. Calabrese made it 4-2 a batter later when pinch-hitter Jayson Hannah hit an RBI grounder. BEST EFFORT: Derek Mendez’s closing out the game — Stewart retired New York’s first two hitters in the fifth, but intentionally walked slugger Steven Martinez. Mendez immediately made Iowa pay, slamming the next pitch into the right-center field gap for an RBI double that made it, 5-2. Mendez then relieved Bruno on the mound in the sixth, working a perfect inning, striking out two and earning the save. FLASHING LEATHER: New York wasted little time showing its defensive prowess, turning a double play which ended the first inning. Pitcher Steven Martinez fielded a Blake Larson grounder, wheeled and hit shortstop Gregory Bruno chest high for the force out at second. Bruno perfectly pivoted after fielding the throw, and his snap throw to first baseman Calabrese completed the double play. WHAT IT MEANS: New York advances to Sunday’s winners’ bracket final where it plays Texas. Iowa falls into the losers’ bracket, but can keep its season alive Saturday if it defeats the Rhode Island.